I recently added this painting and caption to the Trombone History Timeline (17th century—1st half). The painting is quite striking, consisting of only four musicians and featuring a beautiful contrast in colors. The trombone in the picture has an extra loop of tubing on the rear bow, making it look remarkably similar to a modern f-attachment instrument. 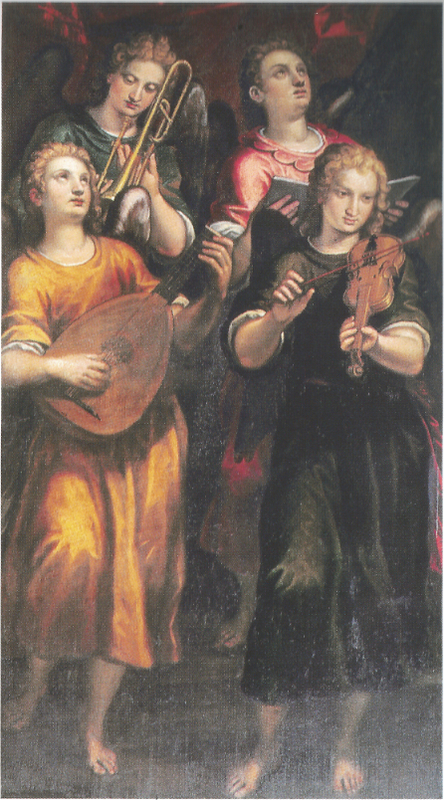 c. 1620—Vicenza, Italy: A painting by Vincenzo Maganza in the church of San Stefano features 4 musical angels, including an angel-trombonist (see below image; public domain) (Die bemalten Orgelflügel 564).